Society of Little Learners has been providing quality childcare for twenty years. We provide your child (6 weeks to 12 years) with a safe, happy, learning environment in our licensed Child Care Center in Hellertown, PA.
We offter an early childhood learning experience that includes a fun filled educational program, called Funshine Express. The program offers weekly themed learning activites that encourage math skills, science, discovery, and exploration of the enviroment, music activities, gross motor activities,and most importantly fine motor activites and reading readiness activities that are an important prerequiste for your child to develope the cognitive skills to enter kindergarden. 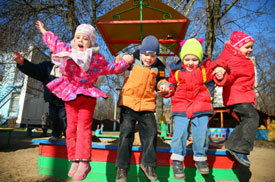 The philosophy of Society Of LIttle Learners is we believe young children learn through play. We provide a hands on educational experience that will enhance your childs cognitive developement. A nurturing environment exists, with a supportive caring staff that encourages the importance of our educational beliefs as well as the importance of family values, respect for one another, individual responsibility, and organizational skills that will last your child a lifetime. Copyright 1988. Society of Little Learners Inc. All right reserved.